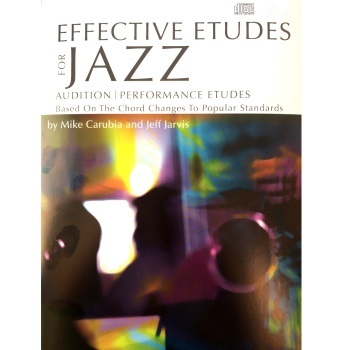 This collection of 18 audition/performance etudes based on the chord progressions to popular jazz standards, blues, and rhythm changes. The collection was designed for honors jazz band auditions, solo evaluations, group lessons, teaching the jazz language and improvisation, learning standards, and more. Presented sequentially according to difficulty, the etudes have annotations beneath the staves identifying phrases and patterns common to the jazz language. Chord reference charts show users the notes of all chord symbols in each etude. Each book comes with a compact disc recording of a professional rhythm section and soloist performing all the etudes, plus separate accompaniment tracks without the soloist.